Habit: Annual, perennial herb, [+- subshrub]. Stem: generally branched at base. Leaf: alternate, simple, smaller upward, entire to pinnate- or palmate-lobed; lobes generally small-pointed at tip. Inflorescence: clusters, lateral or open to head-like, terminal. Flower: calyx generally bell-shaped, tube, sinuses membranous, glabrous to hairy, lobes generally small-pointed at tip; corolla generally salverform, radial or bilateral, white to red or lavender. Seed: slender, angled, +- winged, white to light brown. Species In Genus: 30 species: western North America, southeastern United States, southern South America. Etymology: (Greek: like Ipomoea) Note: Perennial herb cross-, annual generally self-pollinated. Ipomopsis depressa moved to Loeseliastrum. Habit: Perennial herb. Stem: 1--4 dm, sparsely puberulent. Leaf: basal 5--35 mm, pinnate-3--5-lobed, lobes remote, linear; cauline entire. Inflorescence: open, in upper axils; flowers 1--7. Flower: calyx lobes < 3 mm; corolla +- bilateral, 15--28 mm, tube 5--10 mm, throat 6--11 mm, lobes 5--7 mm, oblong, notched, red mottled white on lobes, throat; stamens strongly exserted; style exserted. Chromosomes: 2n=14. 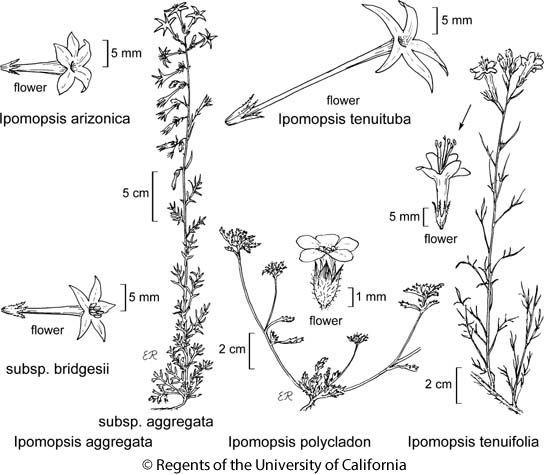 Citation for this treatment: Dieter H. Wilken 2012, Ipomopsis tenuifolia, in Jepson Flora Project (eds.) Jepson eFlora, http://ucjeps.berkeley.edu/eflora/eflora_display.php?tid=29155, accessed on April 21, 2019.
se PR (s San Diego Co.), DSon; Markers link to CCH specimen records. Yellow markers indicate records that may provide evidence for eFlora range revision or may have georeferencing or identification issues. Purple markers indicate specimens collected from a garden, greenhouse, or other non-wild location.